​We offer tools for accountants who want to do more. Who are tired of deadlines on the 15th of every month and the scramble to catch up with clients once a year. Who really want to make a difference for their clients. Who see their roles differently. Who want to inspire, motivate, and retain their staff. Who are looking for a better way. If that is you, read on. Your clients need you to help them figure out how to succeed in this changing world. ​Are you tired of the hype? Of people telling you your existing business is drying up? Are you ready for a step by step approach? Tools you can use right now, with your existing clients? Our Level 5 Certified Advisor Program is designed with you in mind. No More Random Acts of Consulting! 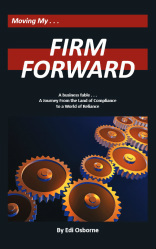 Learn more about the Level 5 Consulting Methodology in the Kindle edition of Firm Forward, by Edi Osborne available on Amazon. "If you are involved with running a public accounting firm, you should be able to relate to the story. Almost every point made in the book are the exact challenges we've been discussing at out firm." It's getting 5 ***** Reviews! "Level 5 Service" - By Edi Osborne with special bonus recording "The $50 Million Leadership Secret"
Hear Edi Osborne talk about "Random Acts of Consulting" and how to avoid them in this podcast from Hector Garcia. Want to know where to start when it comes to consulting? changes everything for you and your clients. Over $100M in Advisory Services Sold by attendees of Mentor Plus training. Click here to hear the whole story!